Get Localization for Photoshop received a facelift and update for Photoshop CC 2015 today. This add-on allows you to easily export text layers to separate XLIFF resource files and also to generate translated PSD and PNG files automatically from resource files. This is handy for example for screenshots and marketing material. Research states that even newborns can recognize their own mother tongue, the language they have heard already before they were born. In the end of 2012 this was confirmed by a study at the PLU in Washington. It is actually quite astonishing that we have this kind of a sense for language so early on in our development. The way a newborn identifies sentences of her mother tongue might not be identical to how we grown-ups do it, but how they do it doesn’t matter, most important is that the special relationship is already there. The same process might happen at the other end of our lives, but the other way round: Alzheimer’s patients might lose their ability to speak other languages than their mother tongue. We might forget all other languages we have spoken for years and perhaps mastered close to perfection, but the mother tongue stays with us. So what do we do with this information? Maybe not that much in every day life, unless you work within geriatrics or are a language teacher. But this is yet another indicator of how important the mother tongue is for each one of us, how deep the connection to our primary language lies within ourselves. However, this is not something we would necessarily be aware of. Some of us might be more comfortable with speaking for example about professional topics in English than in our native language. Or we might consider ourselves even bilingual despite having learned a language only later on in their life. But deep down these newer languages won’t be so close to us as our mother tongue(s). Then what, is all of this important to you? Well, for one you can take it for granted that merely understanding your message doesn’t guarantee that it will stick with your users. Common Sense Advisory’s research shows that people are also more inclined to buying from websites that speak to them in their mother tongue. One of the ways to better attract users and make them stay longer on your website or use your app is to talk to them in the language that they have the longest lasting relationship with. And for most people on our planet, that language is not English. 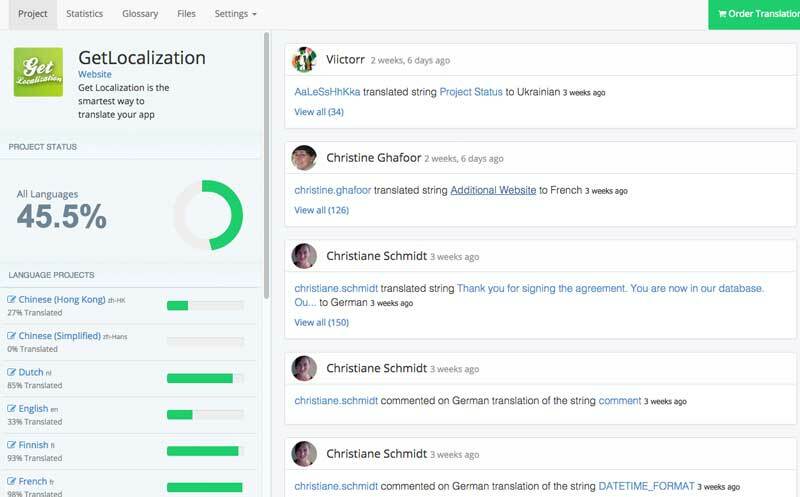 Get Localization helps you talk with your clients by providing an easy solution for managing software localization and ordering professional translations. elia Networking Days in Tuscany (October 6-7), where Jari will be speaking about agile and lean in localization. We just released a new video about Get Localization Now, our professional translation service designed for customers who might only have occasional needs to translate content (opposite to continuous translation, for continuous translation we recommend Get Localization Workspace). We had a webinar about apps localization & translation with Nokia earlier. It’s meant for Nokia Asha developers but provides a lot of general information about app localization as well.